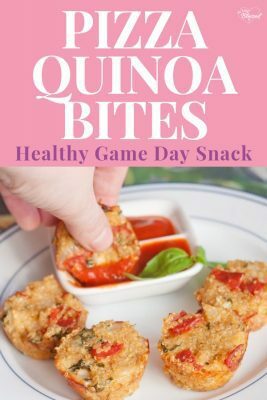 These quinoa pizza bites are protein-packed bites that make for the perfect healthy snack for kids and game day snacks! 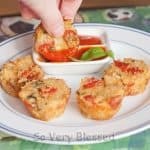 These would make a great healthy snack for a Super Bowl party, perfect for a kid-friendly pizza night snack, and a great high-protein lunch for lunch boxes. The fresh basil adds a big flavor punch, but the combination of the basil, oregano, paprika, garlic, and onion seemed to meld perfectly to bring all of the pizza flavor in a tiny little bite. You could definitely sub turkey pepperoni to make them a tad healthier, if you were so inclined, but I used the regular pepperoni and these babies are still only 35 calories per bite. Not bad at all, especially with the protein boost from the quinoa! It would be easy to adapt these to fit whatever your favorite pizza toppings are – bell peppers, mushrooms, sausage, etc. Just make sure to chop the pieces small so that the bites stick together! These are kid-friendly, adult-friendly, and make for the perfect party food, especially for watching the big game! You can also make these ahead of time – they freeze great! I love to grab these for a lunch on the go, fun afternoon snack, or a dinner side. I may need to start making these on a weekly basis. 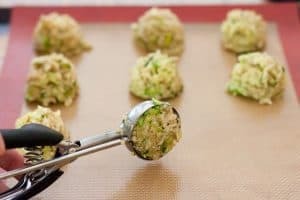 I used to make quinoa bites in a mini muffin tin, but I have since found it much easier to use a cookie scoop to make these bites and bake them on a cookie sheet with a Silpat. Silicone baking sheets are way easier to clean than mini muffin tins! Make a single, double, or triple batch, then freeze them. For a healthy lunch idea, take a few out of the freezer the night before to thaw, then just stick them in your lunch box in the morning. Depending on your taste preferences, you can eat them either hot or cold. You can also take them straight from the freezer and heat them up in the microwave. Looking for more flavor combinations? Here are some more popular quinoa bite recipes! Check out all of my other quinoa bite recipes! Instead of using a mini muffin tin, you can also use a cookie scoop to form your bites on a cookie sheet to bake. oohh those look amazing! My husband and girls would eat them too 🙂 I’ll have the try them. i’ve made these so many times over the last year and a half and my family and i just love them. thanks so much for the recipe. Just made these for my gf/df son and he loves them. I omitted the cheese and added diced mushrooms, spinach, and ham. I’m really excited about making another batch and freezing them for when he has a pizza party to attend. Maybe it’s the amount of water you add? I make single-serving meals and 1/4 cup uncooked quinoa with 1 cup of water gives me a full cup of quinoa. But then again, I make it in a rice cooker. I love the versatility of quinoa bites! I’m so glad you liked them, Lyndi! My quinoa package says 1 cup uncooked = 4 cooked. I have made these more than once and they are awesome. I cook the quinoa ahead of time, and vary it up with different pizza toppings too….pepperoni and onion, sausage and onion, mushroom and onion, whatever you want! Thank you! I love playing around with quinoa bite flavors! I hope you like them – these are my favorites! I’m so ready to make these! They would make perfect lunches for us throughout summer. I love all the combos you’ve been making! I hope you liked them! Hmm..the onion definitely adds a little bit of bulk, but I wouldn’t think it would be 8 bites worth! Maybe there is a size discrepancy in some mini muffin pans? Sorry it didn’t make as many as it should have, but I hope the buffalo chicken bites are a success! Love the idea of these, and have a batch in the oven right now! I actually halved the recipe and omitted the chopped onions, but I only got 12 bites in the oven. Wondering where the miss is? Either way, I hope to try the buffalo chicken variety next! Thanks for sharing. I used regular, plain cous-cous since I am not a huge fan of quinoa and they turned out just perfect! I baked them for approximately 20 minutes. I also used turkey pepperoni and low fat mozzarella. I stored them in the fridge for the next weeks work lunches…YUM! I’m so glad you liked them, Kirsten! I’ve never made any of the quinoa bites with couscous, but I’m so glad to hear it worked! Hi Marlene! I’m so glad to hear that! I went back and double checked the info for the mozzarella cheese on My Fitness Pal and compared it to the package and you’re right! It should be 320 calories for a cup! I have no idea what to tell you on why the recipe yielded so few bites for you, though! I’ve made this recipe quite a few times and always come up with 30-40 bites…I’m sorry about that! My part-skim mozzarella has 80 calories per 1/4 cup, so 320 calories for 1 cup. What kind of cheese did you use? Also, I only got 24 bites out of this using my mini-muffin tin. (I cooked 1 c quinoa in 2 c water and used all of it in the recipe and followed the recipe exactly.) How’d you manage to get 40 bites out of this by filling your muffin tins to the top? Of course, since I got fewer bites and since my mozzarella has more calories, mine came to a little more than 250 calories for five bites even though I substituted the turkey pepperoni, which has about half the calories of regular pepperoni. Vegetarians eat animal products. Vegans do not. thnaks so much Love these! I thought they sounded amazing. I have 3 little boys, one of which is so picky with food the look of these actually made him cry. He repeated “I don’t want this! I don’t even like this” until I left the room and when I peeked in he snuck a bite with noone looking and yelled “YUMMMM!” I swear to god people, if little Zachy can eat these and love them, ANY OF YOUR KIDS WILL!!!! for us vegan’s what can you substitute the egg with?? not worried about the chz cuz I can use vegan chz. Mmm…diced vegies would be a great addition! Someone else suggested gum chewing, too! I never have gum in the house, but am adding it to the grocery list just for this! That’s really good to know! I haven’t tried any cold! Thanks! I’m so glad you liked them! 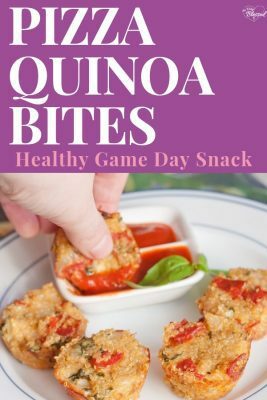 I love quinoa bites, because it’s so easy to modify the flavors to fit your tastes! Oh man, I hope it works! It’s so hard to get away from junk food! My husband was raised on fast food, so when I tried to feed him all home cooked meals when we got married, there was a big adjustment period! I’m so glad your family likes them! And it’s good to know they’d still be good without the pepperoni – I haven’t tried them without it! I’m so glad! You’re very welcome! Mmm…I love the idea of cheese chunks! Great idea! You’re right! There are! I just used the traditional regular white quinoa! What kind of quinoa did you use? There’s so many different varieties! The first time I made these I thought the cheese got a little lost. So now instead of the shredded mozzarella, I cut string cheese into small pieces and insert them into the middle of the quinoa bites. This way there’s a bit of gooey melty cheese in the middle when you bite into them. I put a bit of grated parm in the mixture as well. So good! I’ve got a batch in the oven right now! Did you use the eggs and cheese in your vegetarian version? It like it very much! Thanks for this great recipe! I ate a few today right out of the refrigerator. Taste great! I just made these the other day. My family likes them very much. I did make a few without the pepperoni in them. They also have a very good flavor. I’m making these for a Superbowl party that we are going to on Sunday. I’m soooo going to try these! In a quest to eat healthier, I’m having a hard time finding recipes my teenagers will eat. They are so addicted to junk food I can’t get them on the “eat healthy” train. This looks like it will hit their “junk food” spot, without the junk. I can’t wait to try them. Great recipe! Just made these last night but used slightly less onions and spices, according to my palate. Thank you for sharing this wonderfully healthy and delicious recipe! Do these and your other quinoa bites have to be served hot/warm.. or are they still ok tasting if they have cooled down? I don’t know if you’ve tried it, but chewing gum what cutting onions stops the tears! You’re so welcome! I hope you like them! And I didn’t even know there was a post on My Fitness Pal about them! Thanks for letting me know! This looks amazing, thank you! (I came here via your post on MyFitnessPal). Hmm…shades, huh? I’ll definitely try it! You’re so welcome! My husband was pretty hesitant about quinoa, too. Thankfully, it went over really well and now he begs for me to add some sort of quinoa bites to our weekly menu! I hope it goes over well with your husband! Is there a chance you input 2 cups uncooked quinoa instead of cooked? That’s the only thing I can think of that would up the calories that much! Hope that helps! They sell onion goggles?! How funny! I tried this the other day, but only kept the onion in the freezer for 5 minutes and it still brought tears! Next time, I’ll keep it in there for 10 minutes and see if that helps. Thanks for the tip! Thank you so very much for posting this recipe. 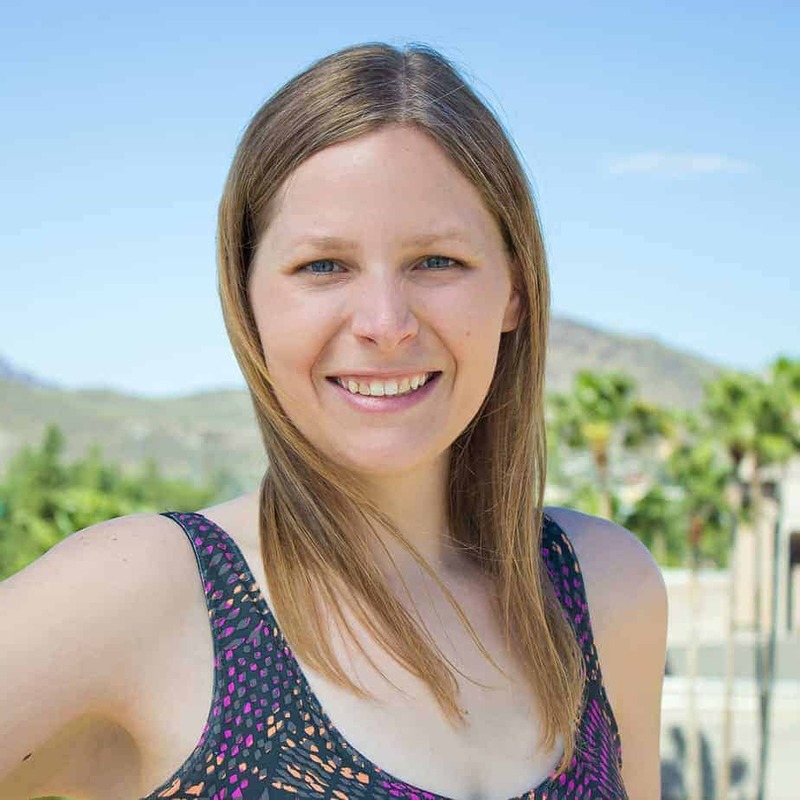 My toddler and I eat gluten-free foods, and are trying to get my husband on board. He’s a bit reluctant but seems to like quinoa, so this is going to be perfect. I used amarenth as well and turned out great! They do sell onion goggles but I’ve never used them. I just put the onions in the freezer 5-10 minutes before chopping, and there’s no tears. The stuff that makes you cry gets ‘frozen’ so it doesn’t release and bother your eyes – works like a charm every time! You’re welcome! We tried a recipe for quinoa tabbouleh and really enjoyed it! Yum! I love sun-dried tomatoes! You’re welcome! Ooo…I love all of your additions! Your version sounds fantastic! So glad you liked them…sorry they didn’t release easily! I’ve heard that people have frozen them successfully, both cooked and uncooked, but I haven’t tried it myself yet! That’s really good to know! I would have had no idea what to suggest as a substitute, though I would think couscous would work, as well! Yum! Love the idea of adding sauteed zucchini! Interesting! I’ve tried safety goggles, but never pool goggles! Chewing gum, huh? I haven’t heard of that one! I’ll certainly give it a try! Thanks! These are definitely a good introduction to quinoa! This was just a store bought jar of pizza sauce. I believe it was just Great Value, but I can’t remember for sure! I keep meaning to make these in a silicone pan, but I keep forgetting! Great idea! Ha! No shame there, Olivia! I’ve been known to make multiple batches back to back! Love the idea of making little quinoa balls! This was so yummy!! Just made it for my family and they all approve, from the 1 year old up! I lined a cookie sheet with tin foil and sprayed with Pam. Just formed little balls out of the mixture and baked. I mixed it all together when the quinoa was still warm and they held form beautifully. Thanks so much! I heard that if you light a candle while you’re chopping onions that it helps burn off whatever it is that makes us cry! Seems to work pretty well! I can’t wait to try this next week, just put everything on my grocery list! A silicon muffin tin helps prevent sticking and they pop out easy. What is the pizza sauce that is used? I just made these. I was so excited, but they fell apart on me. Boo! I am wondering if my quinoa was too wet. I have only made it once before and I don’t remember having to strain it. This brand asked me to strain it. It also asked me to use a tsp of salt, which I did and it was way too salty. Im going to have to try it again because other than all of that it was really tasty! lol. I also used a big muffin tin so that may have had something to do with it. However, to answer a few peoples questions I got exactly 12 out of the mixture in the big muffin pan. These look so yummy! I haven’t tried quinoa yet. My favorite dairy-free cheeses are made by brands Daiya and Teese. In my opinion, Daiya has the best mozzarella, while Teese has the best cheddar. You can find them online at veganessentials.com, or at Whole Foods, or at many other health food stores. Another option is to just mix in some nutritional yeast to give it a cheesy flavor, but you won’t get the cheesy texture. Thanks for this tip! I was trying to decide how to make them vegan, and the egg component is always hard to solve. I am making these today for football Sunday. I’ll let you know if they’re a hit! An FYI for chopping onions: just chew gum! It’s crazy, but it works for me! I used 1/2c sharp cheddar and 1/2c mozzarella. Omitted pepperoni and added sauteed zucchini and onion instead. Delicious! Made 24 mini muffins and a small ramekin. Topped the ramekin with panko. Trader Joe’s sells cheeses made of tofu. They have a tofu-rella that’s gotten good reviews… Maybe something worth trying? I just made a double batch with millet and it was great! Sounds delish! Cannot wait to try these out—maybe this weekend. Has anyone tried freezing them? I live on my own and don’t need a whole batch but if they freeze well then I can still make them with the recipe as is! I had the same issue (and that was the only issue, they were DELICIOUS!) I think it was partly because I didn’t squish them into the pan quite enough, but I would still go for an extra egg in the recipe next time. Yummy, I need to take out the meat and sub out the cheese and these will be perfect. Is this gluten free? Thanks! I have missed pizza because I’m on a weight loss journey and I don’t eat processed foods or dairy or most grains. This is awesome! You know what sounds really good in these? I’m thinking a basil pesto w/parm on top. Or chicken, parmesan, tomato. If you chopped the chicken real small and put sundried tomatoes in it or diced seeded (to remove excess moisture to keep it from getting soggy)roma tomatoes on top. Oooooh Mama! I’m getting hungry now! Quinoa has so much protein in it too. It’s a great grain substitute with added nutrition. I just wish I could find a cheese that worked well that was lactose free. Allergy free mother of three, I just substituted soaked chia seeds for the eggs. Worked great! If you’re not familiar, soak 3 tbls of chia seeds in 1/2 cup water for 20 min. They seeds form this goo and works great as a binder in cooking loafs, casseroles, pizza bites, etc. you can use ground chia seeds too. I made these for my husband to use up some leftover already-cooked quinoa. He loved them! Is there a way that this can be made eggless?! I would love to make these for my family, but they don’t eat eggs! These sound amazing! What I would give to enjoy pizza again (Celiac’s), thank you very much for sharing! Don’t have quinoa so we’re using tvp. We’re also skipping the pepperoni. Next time I’m gonna add some tiny pieces of veggies. Yummy. Always looking for new quinoa recipes! Found you on Pinterest. Can’t wait to try these – thanks for sharing! I’m thinking if I use sun-dried tomatoes I won’t even need to wait for the pizza sauce. Thanks for the great recipe! Thank you so much! I’m so glad they fit into your food plan! Thank you thank you thank you! 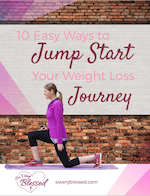 I had weight loss surgery in December of last year, and pizza is a total no-go. These are great and totally fit in to my food plan. You are a genius. This sounds heavenly!! I love quinoa, I think my lil girl would love these!!! Traci, thank you so much for the tip about the onions! I’ll definitely try that! Heidi, I didn’t think I’d like quinoa, but both my husband and I have completely fallen in love with it! I hope you guys do, too! I can’t wait to make these. My husband and I are trying to eat more healthy foods. Never had quinoa but I’ve heard it’s wonderful. If you keep your onions in the fridge, you will not cry when you cut them! I’ve never made them in a big muffin tin, so I have no idea how many the recipe would make, so I’m not sure how to calculate the calories for it. Sorry! Nantucket Daffodil, you can absolutely share it on your blog! Thank you so much! Cooking these right now! Amazing…they smell so good. May I share on my blog if I credit you and give a link back? It’s a keeper! If I used a bg muffin tin pan how many per serving and calories would it be? They are baking in the oven right now. It’s hard to find gluten-free pizza that is decent. This satisfies the taste buds without pretending it’s trying to be actual pizza. I’ll have to try it with crushed red pepper next time! made this with red quinoa and did half a batch with pepperoni and half a batch with sauteed mushrooms/spinach!! I didn’t need the pizza sauce either, Angela! And I bet the cayenne pepper was a great addition! I’m so glad you liked them! Thank you for this! I used egg substitute, substituted cayenne pepper for the paprika and skipped the pizza sauce. These are fantastic. I will be making them again! Thanks for sharing this! My doctor thinks I may have a wheat allergy. Right now I am missing pizza most of all. Yay! I can taste pizza again. I LOVE Quinoa. This sounds delicious! Jennifer, I’m so sorry they didn’t work for you! My pan is pretty non-stick, so maybe that was part of the issue? And if you want them to be more firmly held together, you can always add another egg or so to keep the ingredients bound more tightly. I’m so sorry! I hate it when I follow a recipe and doesn’t turn out right! I just made these, but they all stuck in the pan. I sprayed with Pam, but when I took them out, they all became mush. Such a great recipe!! Thanks! I’m confused now. Is the quinoa 1cup of cooked or uncooked for this recipe? I’m ready to try it but not sure what to do with the quinoa. Robin, you’ll need 2 cups of already cooked quinoa. It doesn’t hurt if there’s a little more. I’ve found that when I cook it, I usually get double to triple the amount I started with. I’d cook 1 cup of uncooked quinoa. If you have a little more than 2 cups when it’s finished cooking, you can either use it all in the recipe or save it for something else! brinty149, I haven’t tried it, but I think they would work in a normal muffin tin! I would keep the same temperature, but increase the baking time 10-15 minutes! Austin – I’ve been wanting to try chia seeds! For those asking if you can do it without a mini-muffin pan, when I made the cheesy quinoa bites, I simply rolled them into golf ball size balls, flattened them slightly, and baked them on a cookie sheet. It worked fine, though they didn’t hold together perfectly. Now that I have a mini muffin pan, that’s what I’ll use next time. Love this idea! but how would they turn out using regular muffin tins? what temperature would you cook them at for that size? I love that I’ve found another quinoa fan! These look totally incredible. Can’t wait to make them! Does anyone think Bulgar could be substituted for the quinoa?? I have never made anything with quinoa before. This looks like a very tasty way to start! Hubby LOVED these!! He made them “Indian” using those spices and next we plan on making them “Mexican” with some taco seasoning dipping in salsa and/or guacamole!! Wow–I had to try these, and they were amazing. My children and I couldn’t eat them fast enough. They barely came out of the oven, and these delicious quinoa pizza bites are already gone. Thank you for sharing this recipe. That looks amazing!! Bookmarked to do this next time. OH my GOSH! These were sooo good! This was my very first experience ever with Quinoa…I am so impressed! Also if anyone out there on Weight Watchers… these are just 5 points for 5! how important is the cheese? I’m vegan but this sounds super tasty! These look great for the kiddos. Would you recommend any substitutions for the egg? My daughter is allergic. Thanks! I’m just starting to learn to cook and I’m really excited to try making these tonight after work! I just went to check the recipe and there are 12g of carbs for the 5 bites. I’ll add it to the post! Sorry about that! That’s so interesting, because everything I’ve read so far about quinoa says that it doubles! I Googled it and saw the one website that I’m assuming you saw as well, but everywhere else says it doubles… I’ll have to pay more attention next time! I’ll add a little disclaimer on the recipe that I used 1 cup uncooked quinoa. Thanks for pointing that out to me! Hm, no wonder my batch only made 18 bites. I just looked back over the comments and noticed you mentioned that you used 1 cup of uncooked quinoa. When I made them, I looked online to find out how much quinoa expands during cooking and it said 4 times the size. So 1 cup uncooked= 4 cups cooked. So I only used 1/2 cup uncooked. I’ll try again using 1 cup uncooked and get more bites! Just made these, so yummy. I found a package of quinoa/brown rice blend from the makers of Near East. The flavor was Roasted Red Pepper and Basil which worked perfect, so I did not use any seasonings, I also used the turkey pepperoni and used 1 egg and 2 egg whites and that worked well. I will definitely make these again, great after school snack, church potluck item. Thank you for the idea, helps with my pizza fix. We are tracking our points for WW. Do you know how many carbs for the five bites? Thanks for posting this. This is a great gluten free option for making pizza. Genius. Thanks for sharing. This is BRILLIANT! I’m always trying to find stuff that tasty naughty but isn’t. This is literally the perfect solution, can’t wait to try these. Awesome!! I only have a regular muffin tin.. would I just increase the baking time?? Maybe 25-30mins?? Foodgawker posted this on Facebook and I had to stop by to check it out. I love the fact that the calories are decent. I cannot wait to try this later this week! What a great idea for a healthy version of that pizza flavour we all love 🙂 Definitely trying these! Thanks, Kevin! I like pretty much anything that has to do with pizza! I like the idea of quinoa pizza bites! Anonymous, I love the versatility of these! You’re so right about being able to substitute any of your favorite pizza flavors in them! I haven’t tried freezing them yet, so I can’t help you there! Sorry! DawnyAngel, I suppose you could make almost a cookie sheet-shaped full pizza and then cut it to serve? I’m not sure! Putting them in the mini muffin tin and gently pushing the mixture down compresses it and helps it keeps it’s shape, so I’m not sure if it would fall apart or not on you! Can you bake them NOT in a muffin tin? Like just on acookie sheet? We tried these last night. Very good. Since my wife’s a vegetarian, I made half the recipe with sauteed mushrooms, and it worked very well. They are like real pizza in that you can substitute whatever you like to go with the quinoa, eggs, and cheese. 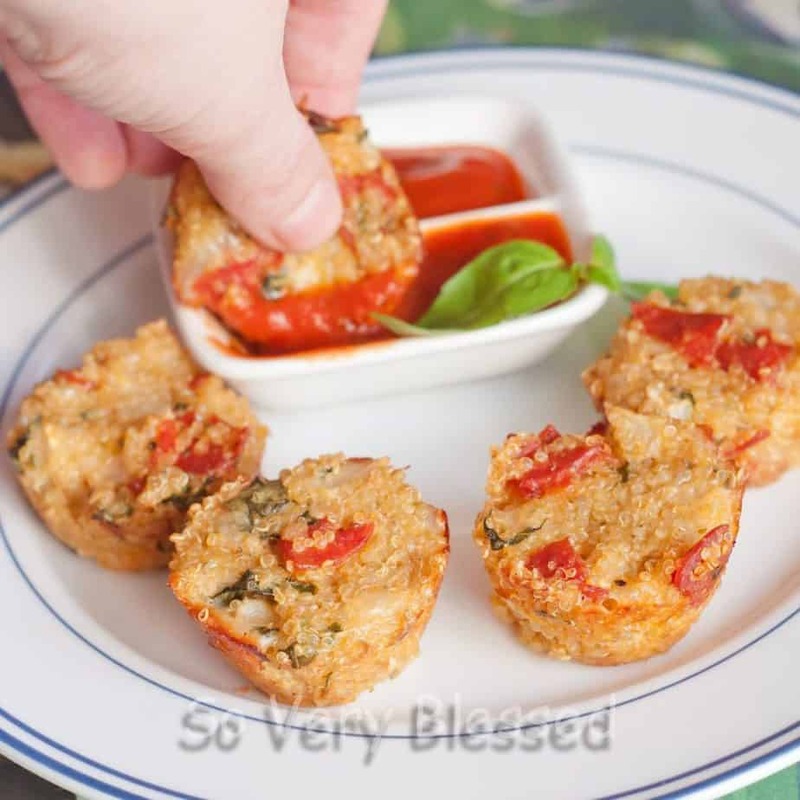 I already made your recipe for the Cheesy Quinoa Bites, now I’m going to have to make these as well! Looks so yummy! WOW..I am going to make these this week-end. My kids are always “drooling” over the pizza bites in the freezer section. I think they will LOVE them! Thank you for sharing! Do you have any idea if the would freeze well? I am just begining to experiment with quinoa.